The speed boost increases a player's speed of movement temporarily. It is useful when you have to escape from a dangerous spot or a group of mutants quick enough to avoid heavy damage. Advanced players can use it to help align the mutants while they run and gun in coop multiplayer. When the mutants come out of different doors and try to swarm the player, one can use a speed boost to run quick enough to avoid getting hit and leave all the mutants behind. You should have the speed boost ready before you use one since if there is a situations in which you would have to run that fast for a short while, you would not be able to switch out for the speed boost fast enough and would end up being hit by the mutants. Some people would use the speed boost in free-for-all deathmatch to evade a strong player. The speed boost is also useful when there are a lot of contaminators around in coop multiplayer. Using the speed boost allows a player to maintain a distance from the contaminators so that they would not keep on throwing kamikaze-caterpillars. 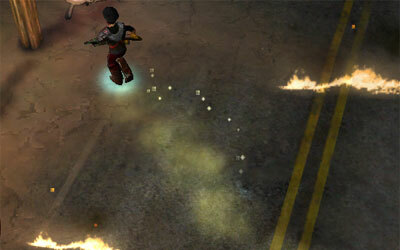 The speed boost can also be applied in situations where one has to deal with a group of drill-mechs. One can dash through the drill-mechs with the speed boost activated and attack all of them from behind.